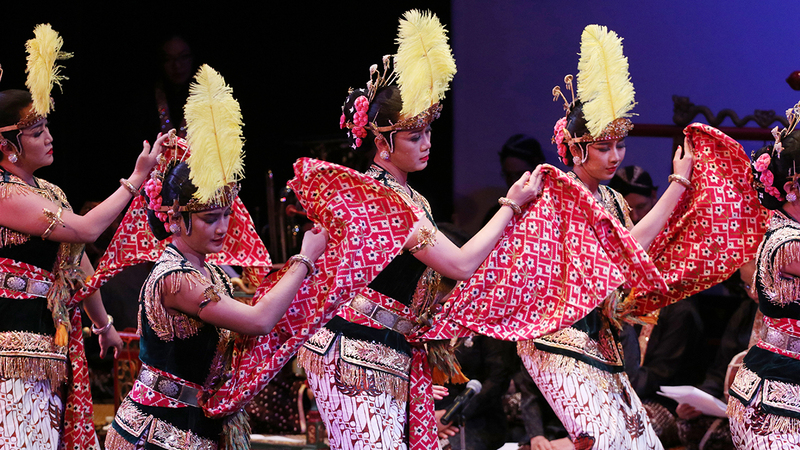 NEW YORK, November 11, 2018 — In conjunction with a visit by Hamengkubuwono X, the Sultan of Yogyakarta in Indonesia, the musicians and dancers of the court perform traditional dances at Asia Society New York. In the second half of the program, nine female dancers performed bedhaya, the classical dance replete with Javanese symbols and philosophies. Bedhaya Sang Amurwabhumi, performed here, is a dance that expresses the will of a king. The creation of Sultan Hamengkubuwono X, Bedhaya Sang Amurwabhumi marks the arrival of a new king and commemorates the legacy of his father, the previous Sultan Hamengkuwubono IX. For more information on bedhaya, read the program notes here.